These images were created using SURFER. They have been used in exhibitions, for logos and other kind of purposes. A collection of short animations created with the SURFER software can be found here. This is a screenshot of an animation originally created for the movie ‘Imagine a Secret’. Elliptic curves have deep and beautiful properties. They are plane curves of the type y2 = x3 + a·x + b that have been studied since the XIX century. That equation in the affine plane corresponds to the homogeneous equation y2·z= x3 + a·x·z2 + b·z3, which describes in space a family of algebraic surfaces with two parameters a and b. The computational variation of these equations generates beautiful animations that stimulate our imagination and evoke our mathematical creativity. 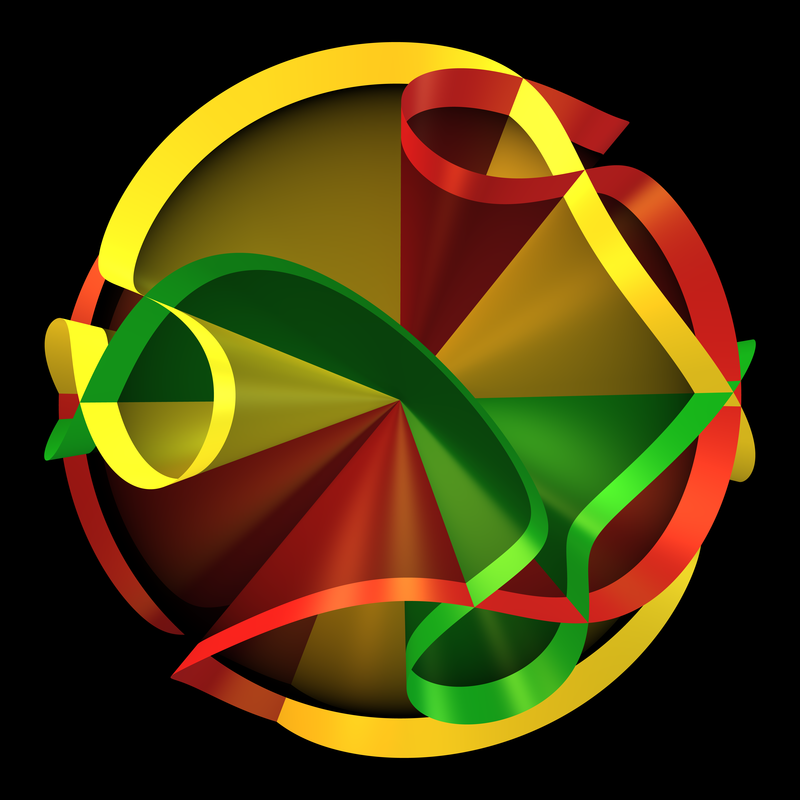 Here, three of such algebraic surfaces are seen (red, green and yellow), each having slightly different parameter values. There is also a semi-transparent black sphere adding a bit of a mystery to the center of the image. 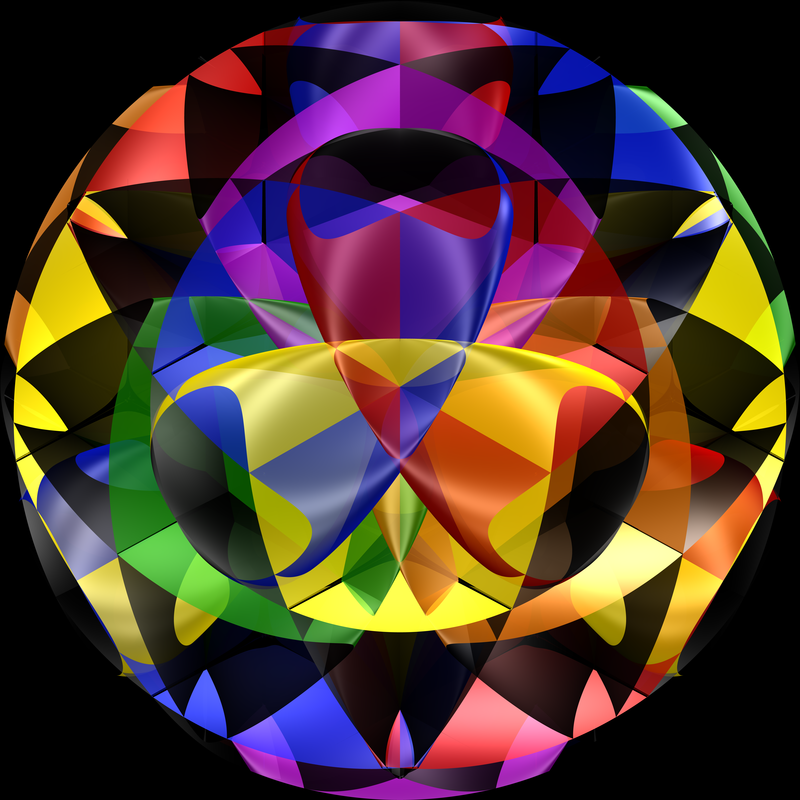 The bright curve-like parts of the three colored surfaces are not included in the black sphere, however, there are still part of the sphere containing the visible space created by the SURFER program. Watch an animation showing these surfaces here. Imagine sewing the edge of a Möbius strip, which is just one closed curve, to the boundary of a disk! The resulting closed surface still contains the Möbius strip and will therefore be non-orientable (you cannot tell what is the outside or the inside - it is all the same). That is why it must have self-intersections in our real three-dimensional space. But can it be done smoothly with no sharp or pointy edges? The formula for such Boy surfaces is by François Apéry. A pair of three-twisted Möbius strips. The Möbius strip is a well-known classical object in geometry and topology which attracts not only professional mathematicians, but many people. It can be obtained by gluing a strip of paper with a twist. If the edges are twisted k times before gluing (with k being an odd integer), the k-twisted Möbius strip is obtained. 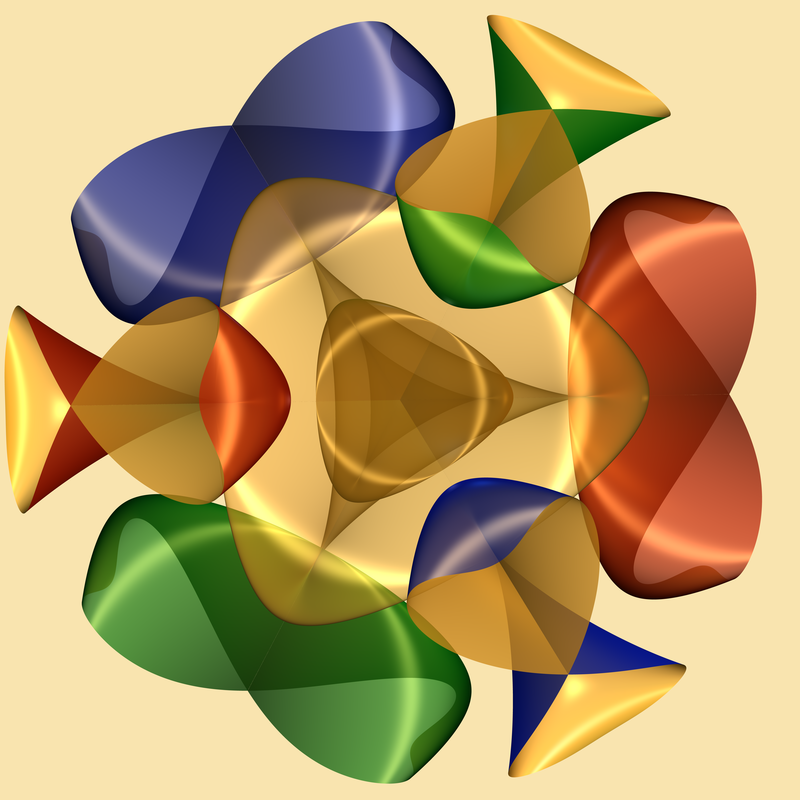 If k were an even integer, the resulting surface would be a twisted cylinder surface. A solid Möbius strip is defined as the boundary of a small smooth tubular neighborhood of a Möbius strip. Find out more about how to create solid Möbius strips with the SURFER software here. In the picture there are 18 Roman surfaces positioned symmetrically around the origin, each surface only slightly translated off the origin along one or two of the coordinate axes, so they intersect each other. Additionally, only a small portion of the whole arrangement is shown in this picture: everything within a small spherical neighborhood of the origin. Anything outside is simply cut off. Even though the Roman surface is non-orientable, which means there is no outside or inside - just one side, the SURFER program assigns two colors to it. Here each surface has one bright first color, while the second color is black, which is also the background color. The logo for the NIMS-IMAGINARY exhibition at the ICM 2014 in Seoul, South Korea, was designed to be similar to the ICM logo, which represents growth with mathematical order, and symbolizes the dreams and hopes for the late starters. The S-shaped logo is reminiscent of the S in Seoul, and also the ‘Tae-Geuk’ image in the Korean flag. The Tae-Geuk symbolizes the harmony of Yin and Yang. The red color is Yang, love and passion. The blue color is Yin, intelligence and dream. The Yin and Yang, however, begin with the same color and shape, representing the oneness of the universe. 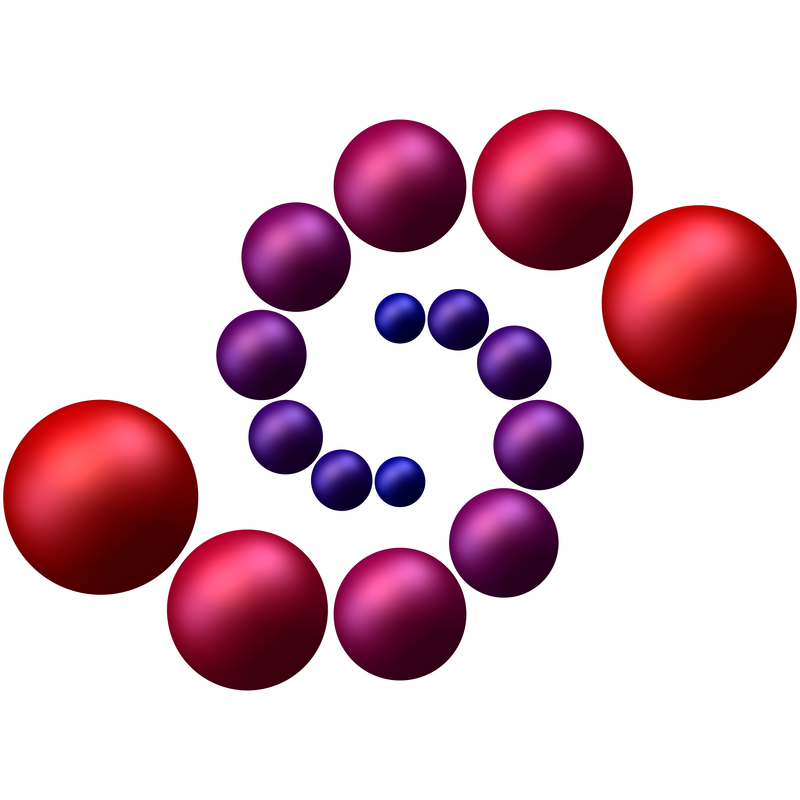 In the Spiral Spheres logo of the NIMS-IMAGINARY exhibition 16 spheres with their centers along two golden spirals (one spiral for k=0 and the other for k=1) are displayed. The function Psi is the parametric form of the spiral curve. The radius of each sphere is proportional to its distance to the origin, which is the length of the vector Psi. Watch an animation of the Spiral Spheres here. 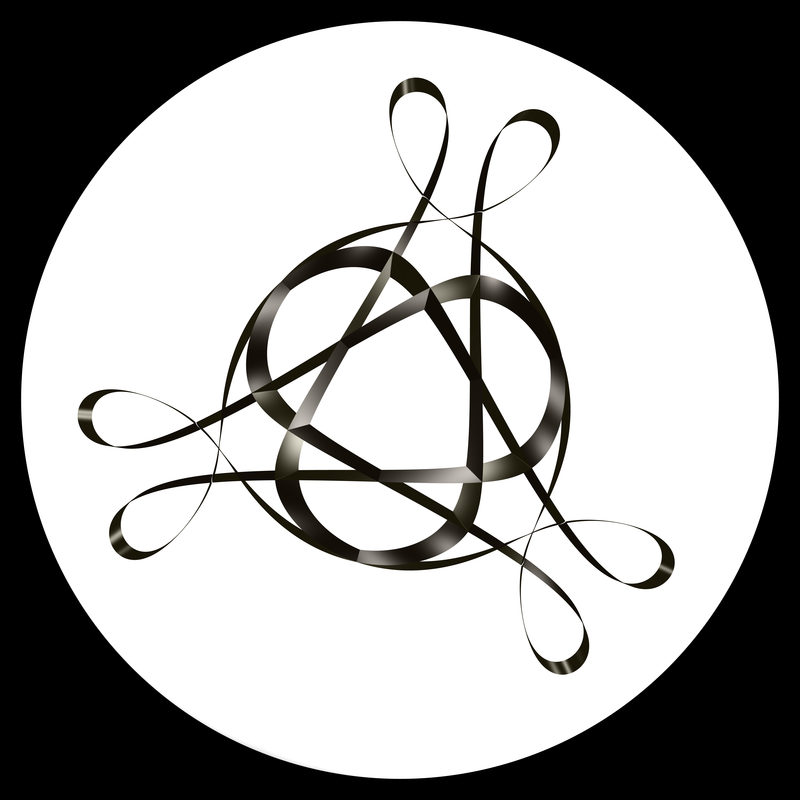 The logo for the project ‘Mathematics in Europe’ was created by combining two versions of the Togliatti Quintic, which is part of the gallery integrated in the SURFER software. The logo combines the European colors and resembles the five-pointed star. It symbolizes the connections and interrelations between the countries as well as the strong formation when working together. Eugenio Giuseppe Togliatti proved in 1937, that there is a surface of degree 5 - a Quintic - with exactly 31 singularities, which was world record at that time. In 1989, Arneau Beauville proved, this is the maximum number of singularities for a quintic. The equation for the shown surface was found by Wolf Barth in 1990. Read more about world record surfaces here. 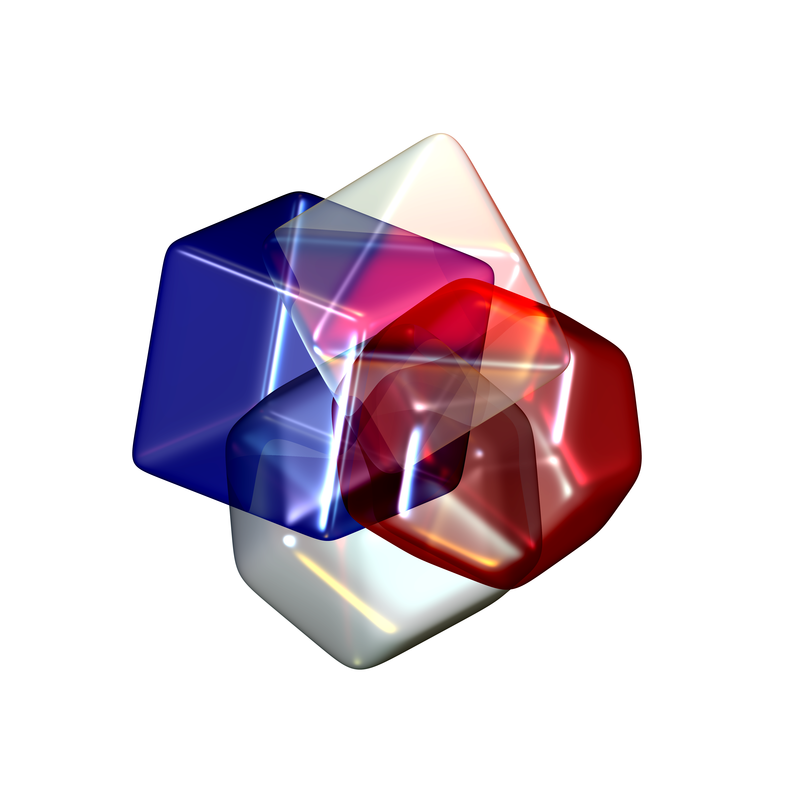 Using a single formula, you can create images of a cube, a dodecahedron, a rhombic dodecahedron, and an octahedron, just by changing the two parameters a and b. This formula was obtained by constructing a dodecahedron out of three golden rectangles. 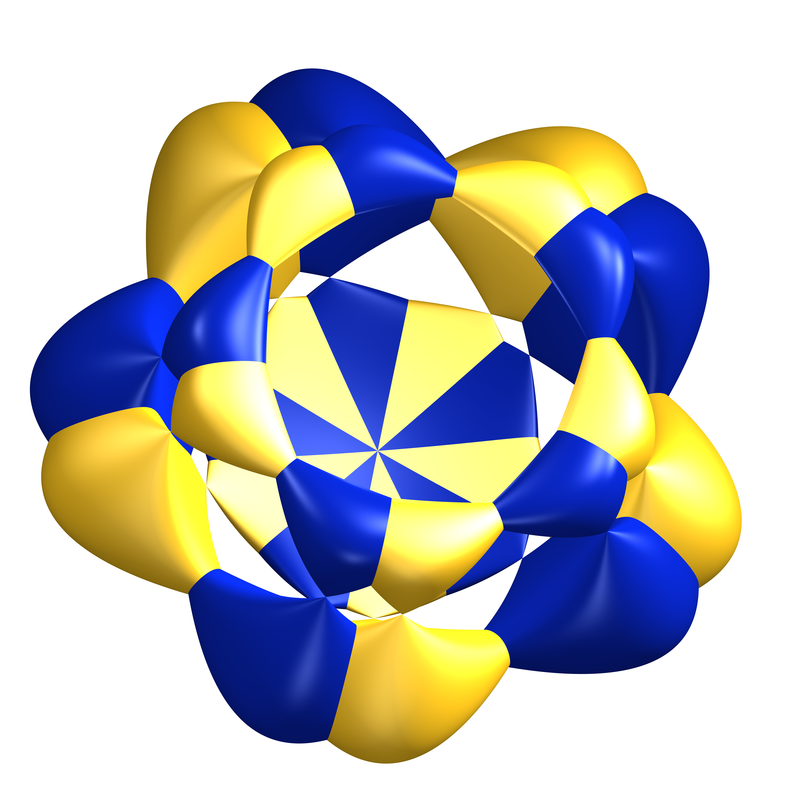 Their 12 vertices span an icosahedron. The dodecahedron and the icosahedron are dual pairs, meaning faces and vertices are interchanged. Taking the coordinates of the vertices of the icosahedron as coefficients of the simple equation ax+by+cz=d describes a plane orthogonal to the corresponding vertex vector (a,b,c). Since an antipodal pair of vertices yields two parallel planes, we obtain six planes parallel to the twelve faces of a dodecahedron. Find out more about the formula here. Watch an animation displaying transformations between these four polyhedra here. This is a screenshot of an animation created for the movie ‘Imagine a Secret’. Here, three of such algebraic surfaces are seen, each having slightly different parameter values. 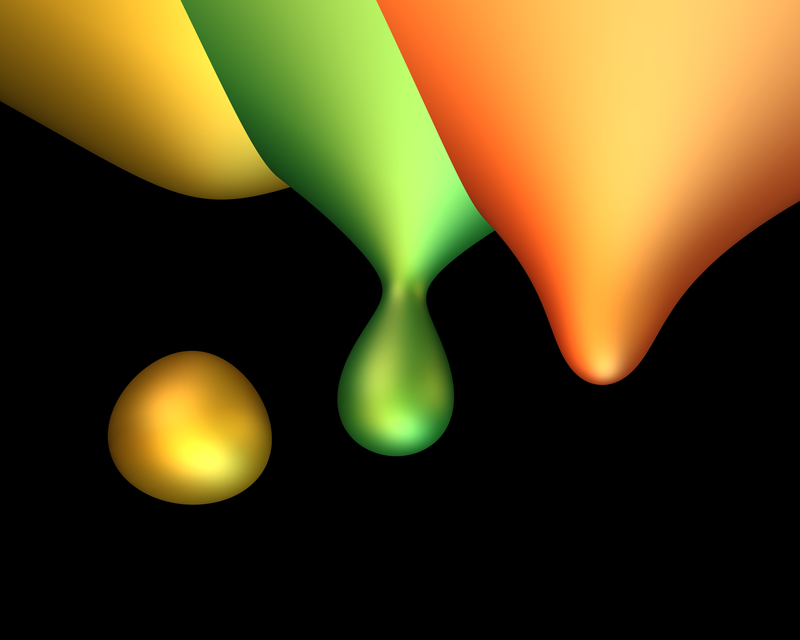 The droplets actually ‘drop’ at different values of the parameters. 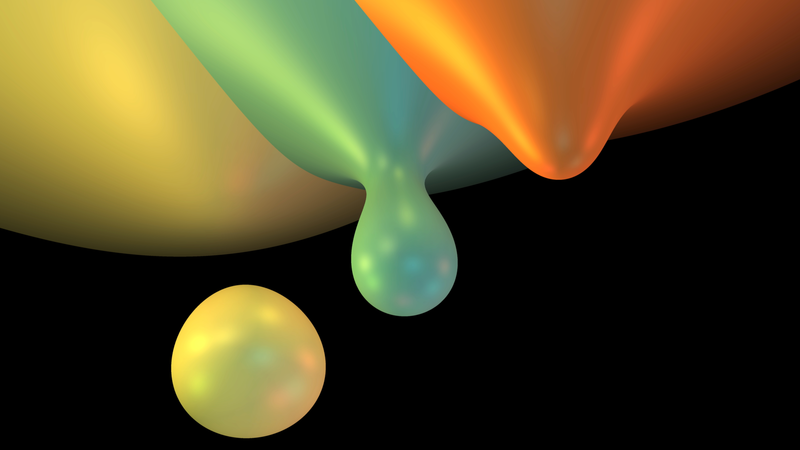 Watch an animation of all three droplets dropping one after another here. 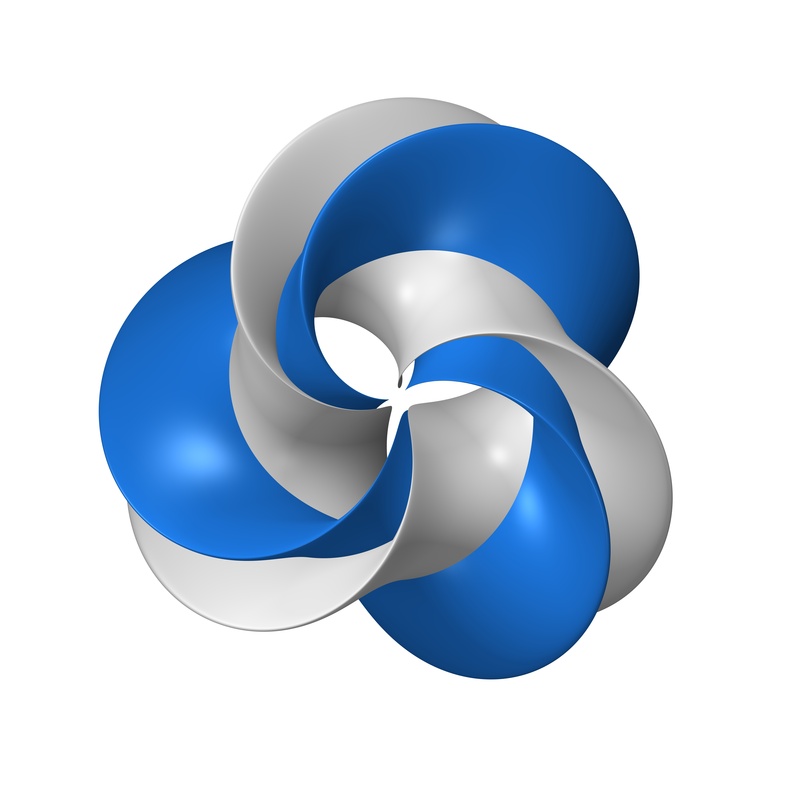 In knot theory, the trefoil knot can be classified as a (2,3)-torus knot. It lies on the surface of an unknotted torus in three-dimensional Euclidean space, winding three times around the interior circle line of the torus and two times around its axis of rotational symmetry.